This 38-year old production is distinctly dull and even amateurish compared with most of the more recent efforts from the Met. Peter J. Hall’s costumes at least add a hint of grandeur, particularly the splendid military uniforms. The full skirts of the women’s dresses have a grand sweep yet the fabrics are of a dreary, muted palette. Lack of stage excitement aside, the opera is a pleasure to hear. Bellini’s music is in secure hands with Maestro Michele Mariotti at the helm. Tempi may be on the safe side, but the expression and colour from the Metropolitan Opera Orchestra are rich and rewarding. Bellini’s gift for melody is evident in all aspects of the music, from overtures and incidental music to choruses, arias and duets. Donald Palumbo yet again provides excellent chorus preparation. The Metropolitan Opera Chorus is arguably the hardest working, most consistently successful group of artists working in New York. 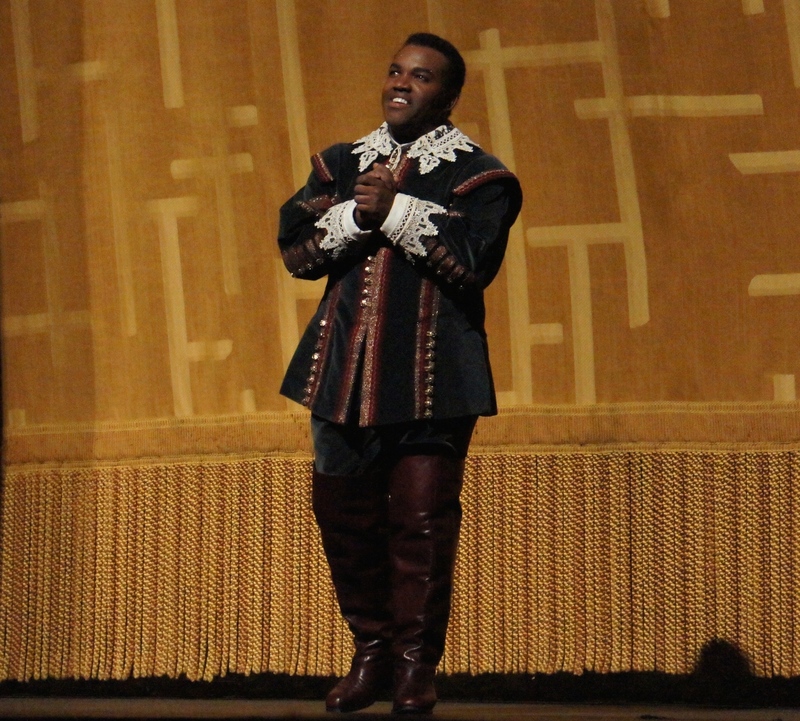 The opening night was somewhat marred by the absence of star baritone Mariusz Kwiecien. It is interesting to note that the Met is happy to bombard us with marketing emails, but when it comes to vital casting news they are deathly silent. This is in contrast to the Royal Opera who respect heir patrons by passing on this sort of news. Despite being a big enough star to open the season opposite Netrebko and be seen in all the season marketing images, Kwiecien’s a absence did not even rate an onstage announcement from General Manager Peter Gelb. Kwiecien’s absence allowed Maksim Aniskin to make his Metropolitan Opera debut in the role of Riccardo, thwarted lover of Elvira. Aniskin possesses a solid baritone voice, powered by excellent projection, yet his overall performance is dull and uninspiring, beyond any allowance that could be made for nerves. Olga Peretyatko, whose Met Opera debut is a significant focus of this season of I Puritani, shares scene two with her beloved uncle Giorgio, played by Michele Pertusi. Peretyatko starts off gently as Elvira, building in confidence and stature as the evening progresses. Arturo, unfortunately, does not appear in act two, much as his spirit looms large over proceedings. Peretyatko really has her chance to shine in this act, with Elvira’s extended mad scene “Qui la voce” followed by “Vien, diletto.” The exquisite melody of each of these arias rings through with great sweetness, with Peretyatko’s understated delivery enhancing the poignancy of the sequence. Pertusi and chorus open act two with “Cinta di fiori” as they all lament Elvira’s descent into madness. He ends the act with duet “Suona la tromba” with Aniskin, the stirring melody somewhat compensating for the lack of excitement generated by their performance. 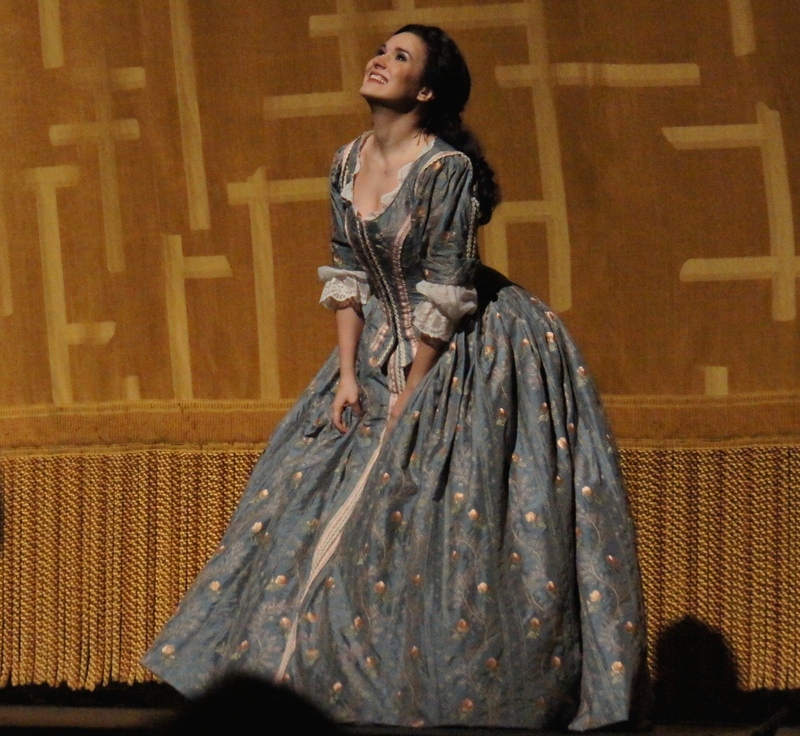 Perhaps the return of Kwiecien in ensuing performances will lift I Puritani to greater heights. 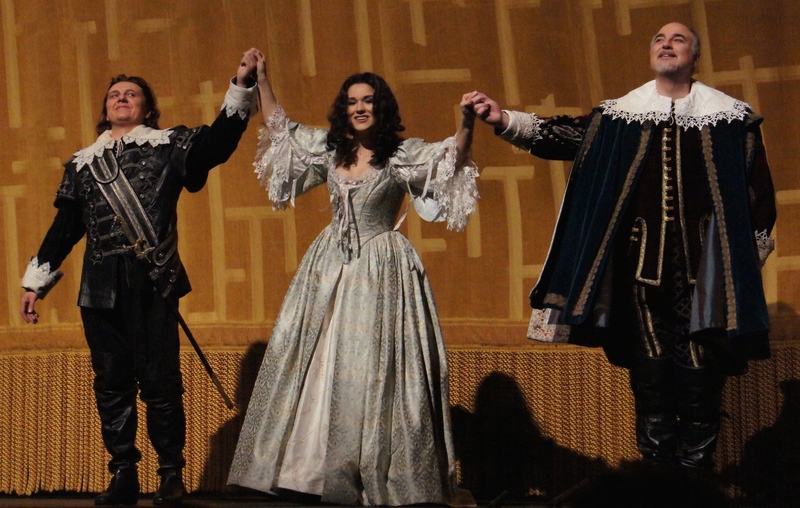 I Puritani was reviewed at its season premiere 17 April 2014. 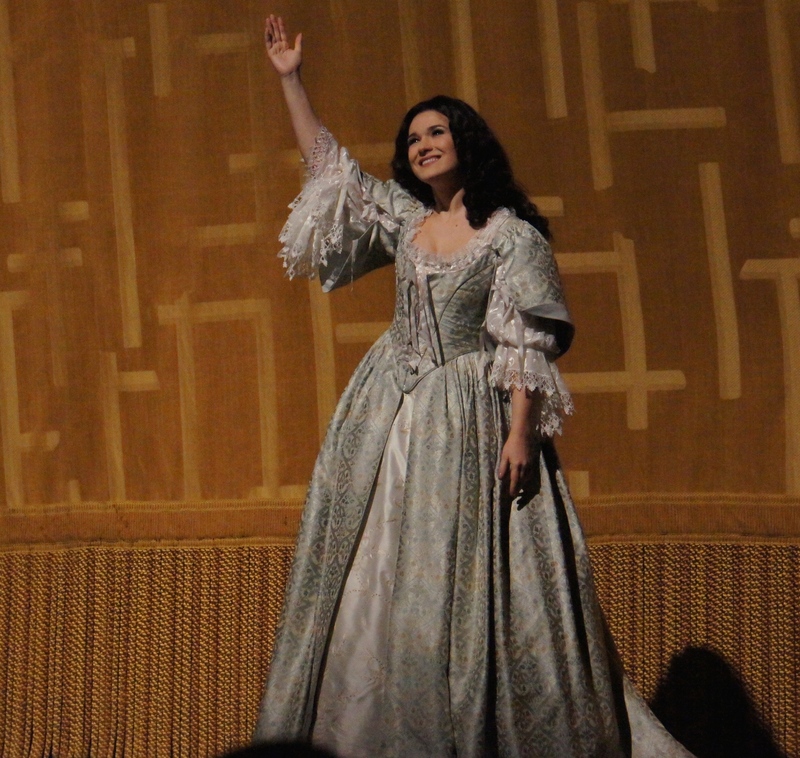 It continues at Metropolitan Opera House, New York, until 10 May 2014. Hey Mark, would you believe there are actually more shows as I didn’t review them all! I also saw Forbidden Broadway, Lyrics & Lyricists: Rodgers and Hammerstein (92nd St Y), America’s Sweetheart (Musicals Tonight) and a return visit to Cinderella (thanks to the new Thursday matinees). I am seeing A Gentleman’s Guide… again tonight (my favourite of this visit) and seeing Lady Day tomorrow afternoon before my flight home. The only thing I didn’t see the time was any movies! I really want to see Captain America, especially after reading your great review today. Hopefully I will have time when I get home. Thanks for all your comments and positive feedback while I was here. I hope you get to see at least a couple of the shows I saw over the next few months (Hedwig and Gentlemen’s Guide are my top picks for you (maybe Cabaret too).